Hey, friends, Missy Whidden here! 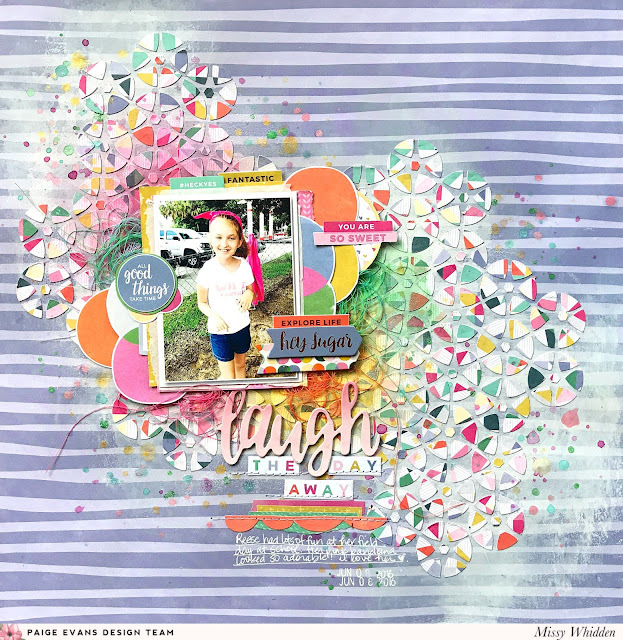 I have a new layout to share today showcasing Paige’s Geometric Background cut file and lots of the Oh My Heart collection. Using cut files is one of my favorite techniques, but on this layout I decided to use all the little bits and pieces that are usually discarded to complete my background design. I cut the image twice on Oh My Heart Paper 05. 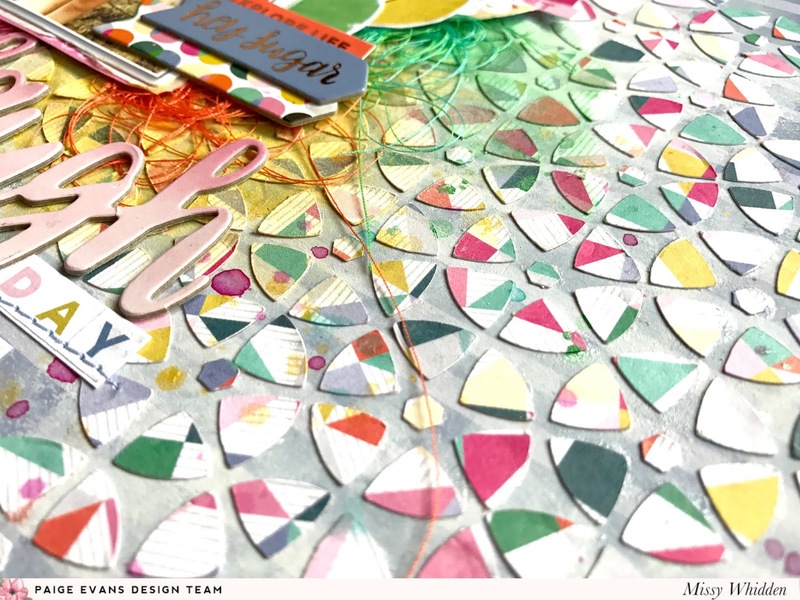 I wanted to create a fun and colorful mosaic type of look, so I placed the outline of the cut file down onto my background paper and very carefully glued all the little pieces back into their places. I then peeled up the actual cut file. I love how it turned out! I used Oh My Heart Paper 15 as my background and smudged a lot of white gesso first before gluing down the pieces. This paper was perfect for this design because it creates all these fun sprinkles of color and it created some really nice texture. 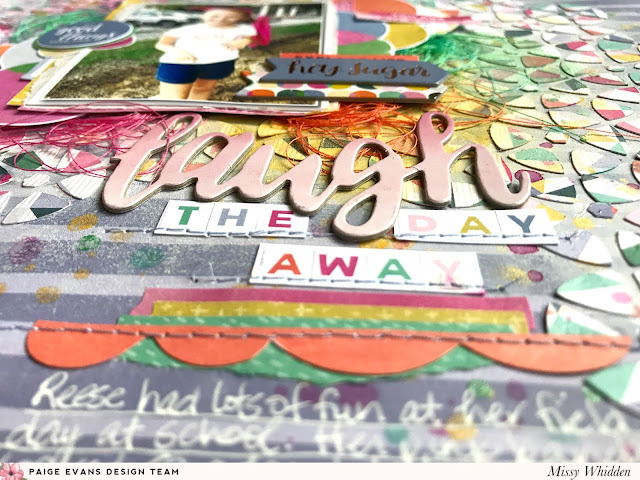 I embellished around my photo with Oh My Heart Chipboard Stickers and stickers from the 30-page Paige Evans #StickerBook. I also tucked in a few colors of matching tangled thread. 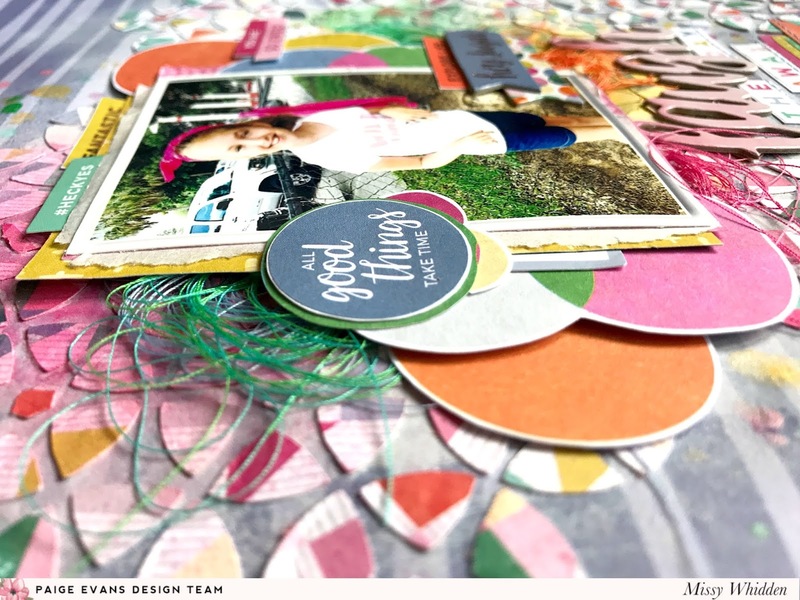 I wanted to play on all the bright colors on the background so I cut a few of the layered circles from Oh My Heart Paper 14 to use as layers around the photo. I also cut a few small ones from one of the washi tape pieces from the Oh My Heart Sticker Book. This cute circle sticker is from the 30-page #StickerBook as are the two stickers above the photo. I did add a few colors of spray inks on the background to add more solid areas of color so the photo could stand out a bit more. I mixed and matched the title by using a piece from the Oh My Heart Chipboard Stickers and some of the small alphas from the 30-page #StickerBook. I also added a few pieces of washi tape underneath and a piece of an orange scallop I fussy cut from Oh My Heart Paper 17. I wrote my journaling in white pen. I hope this gives you some fun ideas to try with your next cut file! Try using the negative pieces instead and see what you come up with! Thanks so much for stopping by! This is gorgeous!!! LOVING that background you created!!! !